Houd Al Kindi and Al-Julands Al Khusaibi, both natives of Oman, transferred to SNR to pursue degrees in water science. 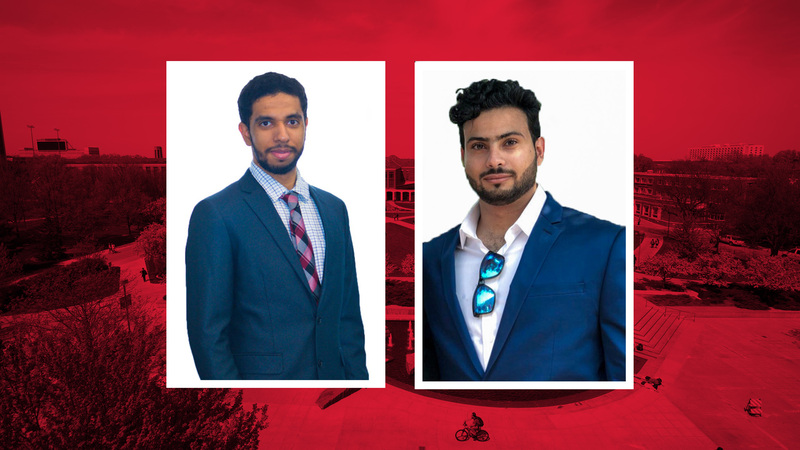 In 2013, Washington State University offered Houd Al Kindi and Al-Julands Al Khusaibi the chance to change their major to anything and stay at the university in Pullman, Washington, along with other Oman foreign exchange students. They said no. They transferred to the University of Nebraska-Lincoln School of Natural Resources to study water science. The major offered them the chance to work in chemistry, physics, math, biology and ecology. Plus, Al Khusaibi said they grew up by the sea in Oman, so a degree in water science just felt right. The two were chosen in high school, along with 1,500 other students, to receive a scholarship to study in America. Their first experience was culture shock; they had to get used to the food, water, customs, and of course, the snow. When they transferred to Nebraska, they found people were friendlier and that more international students were at the university. After four years of hard work, the two are now UNL graduates. To earn their degree, they worked in the field, conducting their own water quality research with Dr. Steven Thomas, river and stream ecologist at SNR. They first met Thomas in Stream Ecology — their favorite class at SNR. The two then got involved with a project in June to collect water quality samples in watersheds around Lincoln. They use sensors to measure conductivity and collect weekly water samples for the lab. Their goal was to see how the water changed over time. “We know we learned so much from this because the whole four years while we were learning our major we practiced it too,” Al Kindi said. These experience reassured them that transferring was well worth it. Al Kindi and Al Khusaibi credit Thomas with much of their success. They said he explained so much and made everything easy to understand. Al Kindi and Al Khusaibi were the only two students on their scholarship studying hydrology in the U.S. They like that uniqueness, and though they faced difficulties, they said it was all worth it for their degree. The two are now in the midst of looking for jobs in hydrology — and they’d like to find them in Lincoln rather than bring their new-found skills home to Oman. Because once a Husker, always a Husker.